Lucy Bernholz, founder of the new Digital Civil Society Lab at Stanford, has some questions for usÂ about how digital civil society affects our work and what else we’d like to understand about it. Â Here’s my answer. PS: And yes, I got a new hair cut. Does Society Form Technology or Does Technology Form Society? These readings address the debate between social determinism (also called social construction) and technological determinism: Â Does society form technology or does technology form society? Â When asked in this way, most of us would answer “both,” Â but this is not usually how the argument goes. There are eminent thinkers on both sides of the argument. Â WhenÂ Larry DiamondÂ talks about “liberation technology” he is implicitly siding with Langdon Winner, who believes that technology can have embedded politics because it can require or be compatible with certain types of political systems. Â People in the State Department who talk about “Internet freedom” are also of this stripe, since the term imputes the value of freedom to the technology of the Internet, in addition to implying that the Internet should be freely accessible. Â Critics like Evgeny Morozov are firmly on the constructionist side of the spectrum: even the most beautiful technology can be made awful in Russia. The Internet began in the Bay Area in the 1960’s, created for the purpose of connecting researchers at different corporate and academic institutions. Â As the number and type of users increased, the value of the Internet expanded from one of research to one of business to one of entertainment and political expression. Â These uses then came to shape what we believe about the meaning of the Internet. Â While some people now justly fear the Internet because of the surveillance carried out through it, others see the Internet as a civic tool which repressive forces are encroaching upon. Â Both are right. Â The Internet is both threatened and threatens. Â These beliefs then form the values of the people who build upon the Internet, and the cycle starts again. 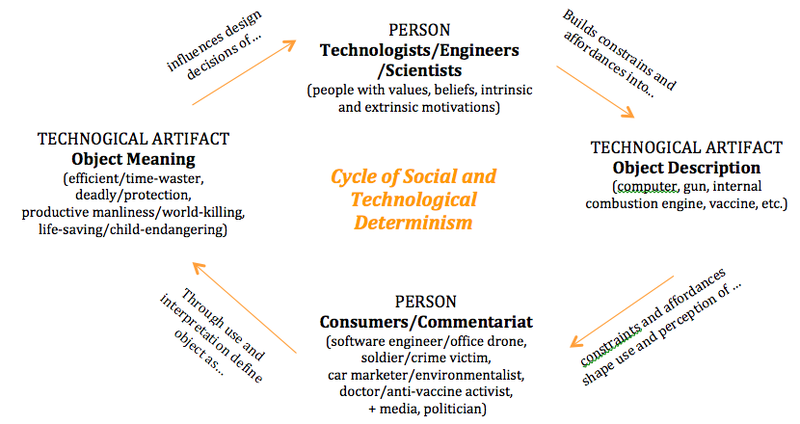 The model above tries to convey the cyclical, rather than oppositional, nature of social and technological determinism. Â One can enter the cycle at any point, but one cannot free oneself from both the human agency of social construction and the human limitation of technological determinism that are inherent in the social meaning of technology. 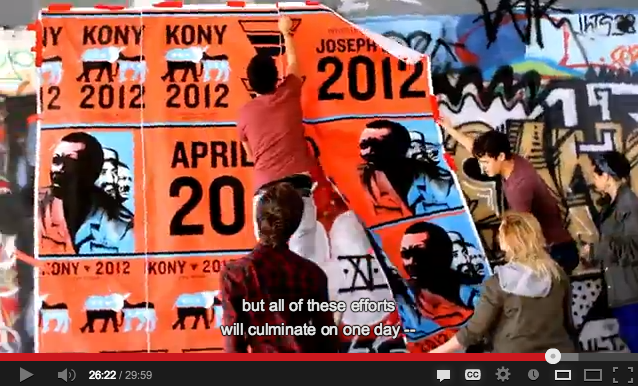 …Weâ€™re seeing activists, particularly young activists, taking on issues through viral video campaigns, consumer activism, civic crowdfunding, and other forms of civic engagement that operate outside traditional political channels. Lance Bennett suggests that we might see these new activists as self-actualizing citizens, focused on methods of civic participation that allow them to see impacts quickly and clearly, rather than following older prescriptions of participation through the informed citizen model. My preference would be to study power, social change, and injustice “outside traditional political channels” in a way that references, but is not constrained by “older prescriptions of participation” like citizenship, civic engagement, and big-d Democracy. These systems are as likely to distract for the real issues of power within a society as they are to illuminate them, especially since these institutions were created in a historical period quite different from the current one. Elections, citizenship, and the courts are the well-paved narrow paths laid before us, but they may not lead most quickly to our destination, if they lead there at all. Alternate paths to small-d democratic social influence – hacking and other digital direct action, social media campaigning – present a far broader and potentially more transformative means of changing the world. Lessig’s typology works well as a means of categorizing the means of civc action, yet the have different histories of practice. Â Elections and the courts, cultural norms (“the personal is political”), and even the markets have the locus of activism for many decades. Â The arena of code is new. Since this arena of social change is the least understood, it is also the most likely source of as yet undiscovered civic innovation. This idea will likely still need to be defended in some quarters, especially against those who defined civic action in different ways in previous eras. If an argument for focusing on the civics of code is needed, it might be that this focus does not belittle the other historical means of civic action. There is simply more that is unknown about the civics of code, which is the best motivation for any academic endeavor.